This companion to the third edition of Exploring Leadership is designed to help you deepen your understanding of leadership and develop your leadership potential. The workbook includes tools to enhance your exploration of the Relational Leadership Model, and exercises to guide your learning. You will discover how to lead with integrity and interact productively with teams and groups, develop a clear understanding of complex organizations, and cultivate strategies for dealing with change. In addition, the workbook includes provocative discussion questions, journal prompts, and space for reflective writing. 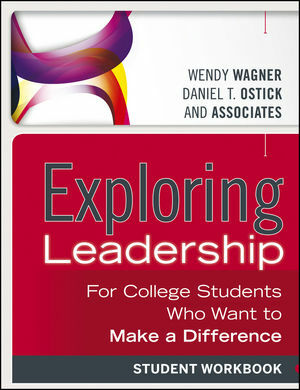 "I would say that this is a must for all student leaders... the perfect companion to Exploring Leadership, complete with engaging activities and thoughtful prompts." Vernon A. Wall, director of business development, LeaderShape, Inc.
Wendy Wagner is the former coordinator of the National Clearinghouse for Leadership Programs. She is the coauthor of the Handbook for Student Leadership Development, Second Edition and Leadership for a Better World, both published by Jossey-Bass. Daniel T. Ostick is the coordinator for leadership curriculum development and academic partnerships for the Adele H. Stamp Student Union  Center for Campus Life at the University of Maryland. He is a chapter author in the Handbook for Student Leadership Development, Second Edition and a contributor to Leadership for a Better World.